The proofs are back and we are excited. This is a first for us. It really puts it there that we are publishing a book, not just talking about it. 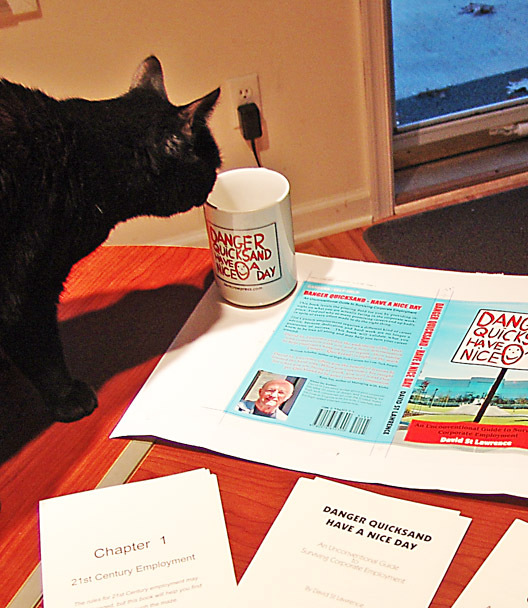 The text proofs are printed on the final paper and cropped to size, so we get a feel for the book immediately. The cover proof is printed on the final cover stock and is laminated so we can see and feel the book cover as it will appear to a reader. This is going to be a solid looking paperback with considerable heft, just what I wanted. The cover lamination has a fantastic sheen and is so much better than the varnished covers I have seen in the past. This cover looks like it will even withstand coffee and pizza smears, so I can advertise it as "cubicle safe". These proofs also give the author/publisher a sobering moment of truth. They show exactly what the book will look like except that the pages aren’t bound. In my case, my inexperience tripped me up in three minor places, so I will require another proof cycle to make sure the changes are made correctly. My first error was in miscalculating the spine width. I was off just enough that I need to adjust the position of the title and author’s name so they will be centered on the spine. My second error was not submitting the text as facing pages. 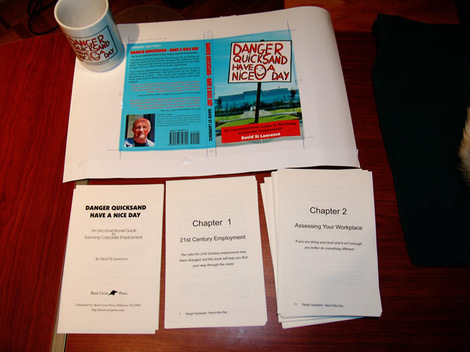 I had designed the document as facing pages, so that the chapters would start on the right-hand pages and the page numbers would appear on the outside bottom corners of each page. This was the correct thing to do. Then, when I read the printer’s instructions, I saw that the document should not be submitted as two page layouts. I interpreted that to mean that I shouldn’t leave it as facing pages. Wrong! I have already fixed this error with one click on the proper check box on the InDesign Document Setup Menu. It was that simple to fix. My third error was in my choice of paper. To me, 70# Colonial White is white! Wrong! It is a beautiful natural paper, ideal for a novel or a book of poetry, not ideal for a reference book. A short conversation with my contact at the printer and I will now be using 70# Husky, which is a suitable white paper for my needs. All in all, an exciting half hour. I will make the necessary changes and upload the corrected PDF files to one of my websites so the good people at Publisher’s graphics can download them tomorrow and begin the proofing cycle again. I want to thank everyone who has already pre-ordered this book. Your final shipment date is still unchanged. I built in enough time to allow for an extra proofing cycle, so the books should start shipping as planned on April 15th. If you haven’t pre-ordered yet, why not do so? I am sure that there is someone in your life who deserves some reassurance and help in managing his/her career in today’s workplace. The main thing is that you are moving. It is closing in to completion. Isn’t this an incredible feeling? A real WoW? The next one? To see your own book in the bookshelves of readers, in bookstores and so on. WoW. Congratulations!!! David, great series you are running. Very informative for anyone interested in publishing a book. David, great accomplishment. Are you celebrating? You are doing such a service to others by writing and blogging your experience. What a gift to the world. You are doing a great thing. I love these posts on the publishing process. It has inspired me to try it myself.